With holiday parties, family gatherings, and other festive celebrations during this time of year I always find myself in need of hostess gifts. I prefer to put a more personal touch on certain gifts especially when I know what the hostess likes. And I have quite a few tea lovers on my list. 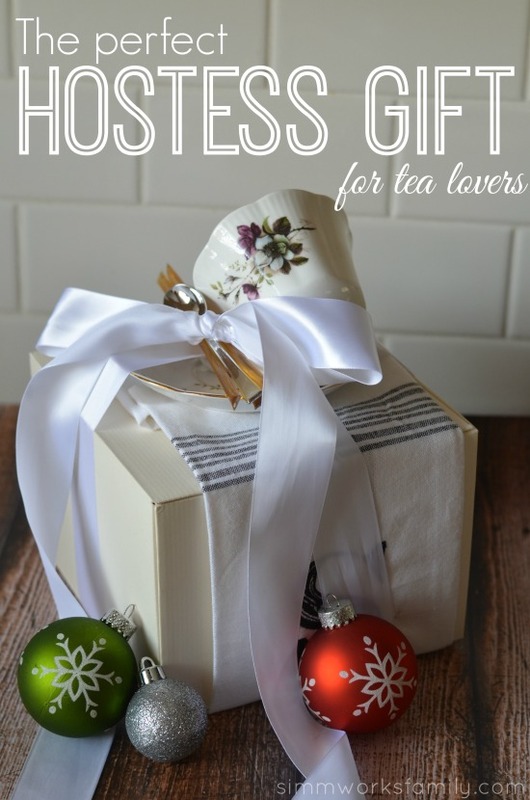 When I started to think about the perfect hostess gift for tea lovers Bigelow was the first thing that came to mind. 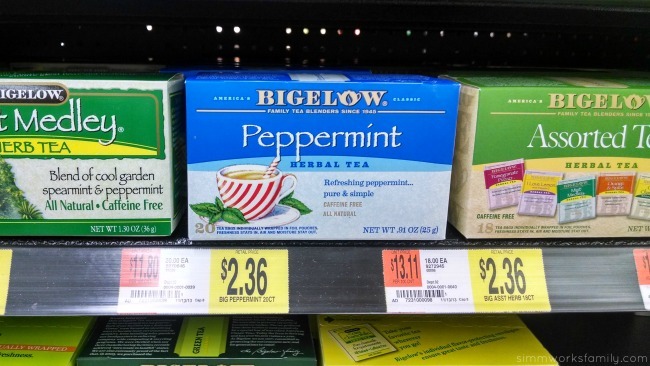 Not only do they have a variety of teas for everyone, but I absolutely love their peppermint tea during the holidays! 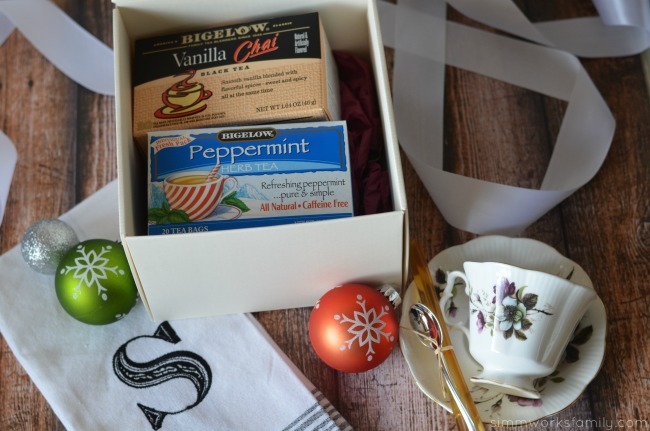 This gift set is perfect for the tea lover in your life. 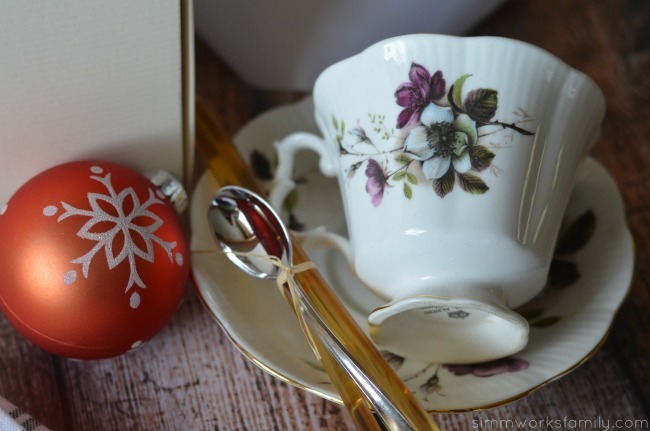 Paired with a cute tea cup and saucer I found at the Goodwill, some honey sticks from the farmer’s market, and a small spoon all wrapped in a monogrammed tea towel, the Bigelow Vanilla Chai and Peppermint blends that I picked up at Walmart are sure to be a huge hit. And with the quality Bigelow is known for that sets it apart from other brands on store shelves, the recipient will surely love the effort you’ve put into this gift. This gift set is very easy to assemble. 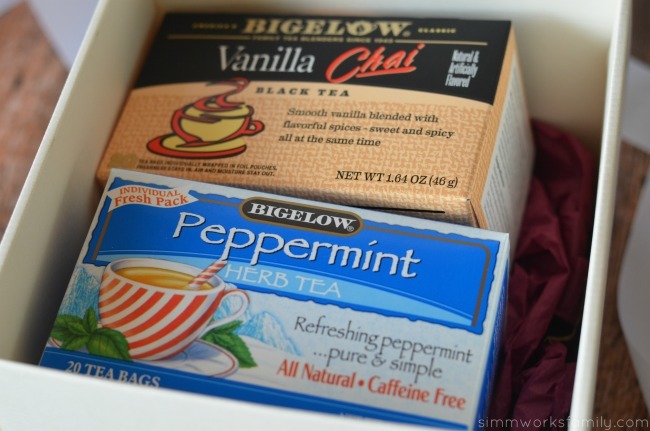 I used a square box I had left over from a gift purchased at Anthropologie that perfectly fit two boxes of Bigelow tea inside. I added a little tissue paper on the bottom to make it pretty and coordinate with the tea cup and saucer. Then I grabbed the tea cup and saucer I found at the Goodwill ($2.99!). After a gentle wash both pieces looked perfect. I wrapped a few honey sticks with some twine and slid in a tiny plastic silver-colored spoon to use as a stir stick. How cute does it look all bundled together? To wrap everything up I closed the box and wrapped the monogrammed tea towel around the box. Then I used some ribbon and wrapped the box on the other side. 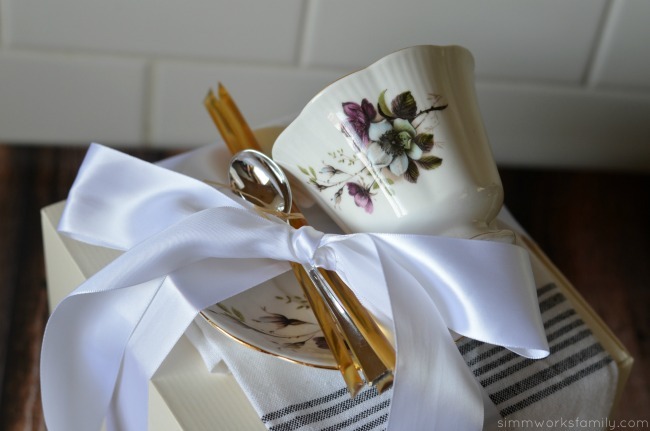 I looped the ribbon into the handle of the teacup to secure it and the saucer to the gift box. Feel free to use some glue dots to firmly hold the saucer in place to the top of the box. 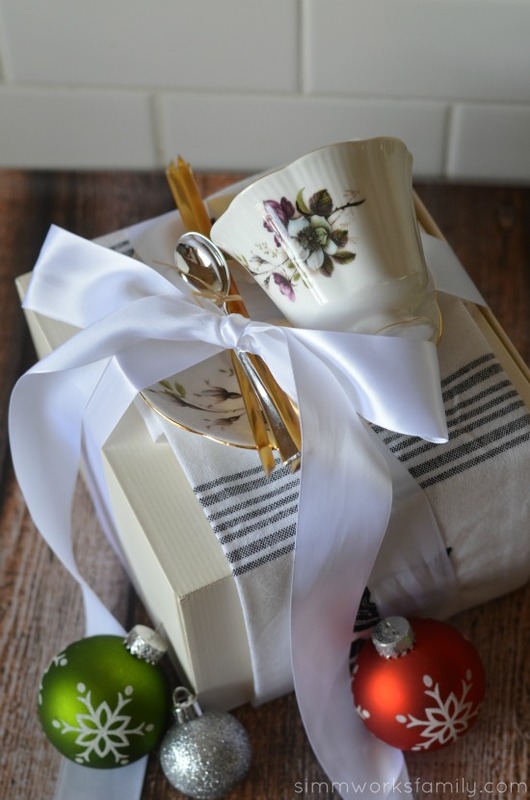 Finished with a bow, this Bigelow Tea gift set is the perfect gift for any tea lover! You could even add a gift card to the hostesses favorite store inside a small card. For more inspiration and stories about Bigelow Tea check out the Pinterest board below. Beautiful! Whoever gets this gift will be sure to love it! 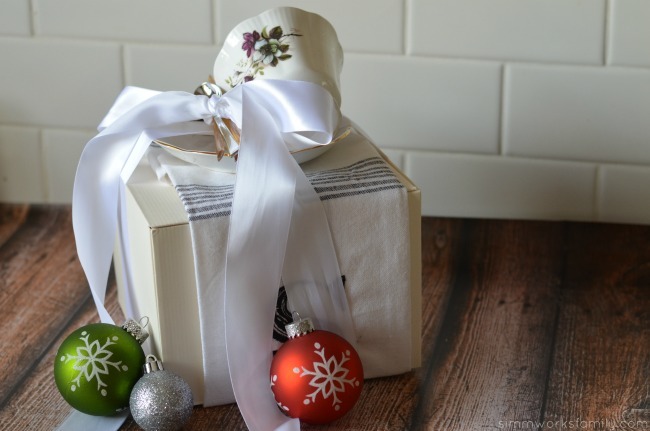 I love having great hostess gift on hand for the holidays! A Bigalow tea set sounds perfect! What a gorgeous presentation! I would love to receive a gift like this. It’s so personalized and just a lovely idea. I also love Bigelow teas! I really don’t have a go-to hostess gift. But on the rare occasion that I do need one I usually give my favorite bottle of wine. This would actually be perfect for one of my Aunt’s. She loves hot tea and hosts monthly tea parties for her book club. I love love love this idea! So thoughtful and adorable! This is indeed a lovely idea for a gift! this is such a great gift idea, so thoughtful and well done. what a great idea, love flavored tea’s – this is something any would use – great idea! This would be perfect for my mom. She loves tea. What a great hostess gift. Especially that it requires no work on the hostesses part (like flowers). Flavored teas are my favorite. That is adorable!! i have given tea before but never as beautifully as this – I’ll do this next time! This is adorable! I have been wanting to put together something for my midwife that was a bit personal and this is a great idea!